First of all -- Congratulations to the winner of my Revolution Foods Giveaway (chosen randomly): CASaundraLeigh. CASaundraLeigh - please email me your address. And, if you didn't win, no worries, as I will be hosting my own exciting Yummy Diet Food giveaway early next week! I *love* garlic toast, although the garlic toast that they serve at most Italian restaurants is generally high in calories and fat, and is usually overly greasy. In an effort to find a better option, I recently created a very simple and quick recipe to create delicious low calorie garlic bread at home in my own kitchen! The recipe is fantastic and it makes perfect garlic toast for dipping into tomato sauce when eating spaghetti with my favorite whole wheat pasta or wildwood noodles. (9) Carefully remove it from the oven and enjoy! This whole recipe comes out to approximately 150 calories, and 2-3 weight watchers points. 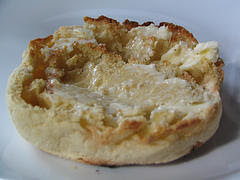 The calories/points will vary of course based on what english muffin or butter substitute you use. Oh yeah, uh huh...I'm all over this one! You just made my day, especially because the Greedy kids will like it too! Gracias! And I neglected to tell you how much I love this blog. Go Juliet! mmm - is it lunchtime yet?! this made my mouth water. love english muffins. hi! i found your blog through coco's (balance, joy and delicias) and was hoping that i may be able to add you to my blogroll. i love how you recommend such great products :D thank you! Yummy! I've been using the Brummel and Brown spread to make garlic bread for my husband and mine is very similar to yours. So delicious and, you're right, far less greasy and fat filled. Nice! Genius! I'm out of English muffins, but I DO have some mini pitas...hmmm...my foodie sense is tingling! Mmmm everyone loves garlic toast! So so so good. i make a similar version of this but i just put garlic salt on a english muffin - throw it in the microwave for 20 seconds..super quick!